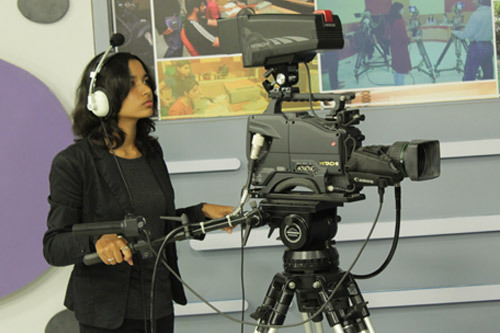 Students in the Television stream engage in the whole range of studio and field work for television news and news related programming. They acquire knowledge and skills in news preparation and presentation; anchoring, interviewing and reporting on camera; and researching and scripting documentaries. They also gain practical experience in camera work, non-linear digital editing, visual and audio mixing, and the creation of special effects and graphics. Broadcast media students are introduced to the specific requirements of writing for the spoken word and for visuals. They undergo voice training under expert guidance. Students are quickly initiated into all aspects of studio and field production. They handle various roles in the production cycle to give them thorough familiarity with the whole assembly line and process of news programming. 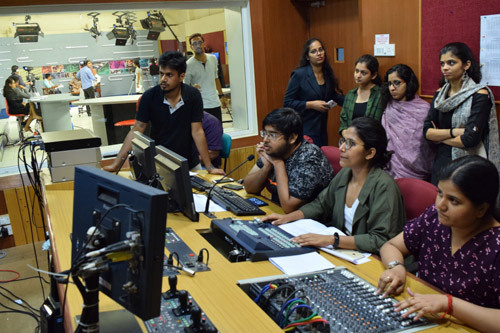 Among the regular programmes students produce are the composite morning show of various segments, news bulletins, current affairs productions and docu-features. They produce news packages and capsules and integrate them with the studio based shows. 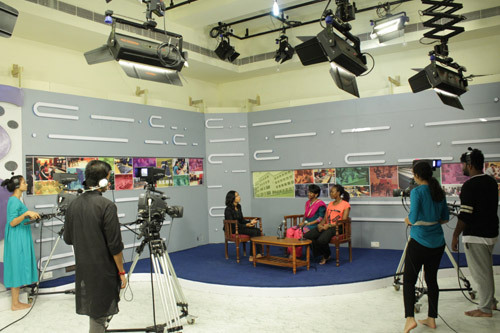 Students are divided into groups and work under the close supervision of expert television journalists from India and abroad. Trainers in the TV stream include veteran producers and senior journalists from reputed international brands in the profession like the BBC. and on the implications for television journalists of ‘citizen journalism’ and ‘user generated content’ to prepare students for the rapidly developing world of ‘digital’ journalism. The digital television facility can handle production and postproduction of the whole gamut of TV news and features, and longer format programmes. The facility includes two multi camera studio floors with non-heating lighting grids and teleprompters; production control rooms with control panels which can handle multiple video and audio sources online and offline; online graphic and special effects generators, ten digital video edit suites with Avid Media composers; and the digital P2 field cameras with memory cards. 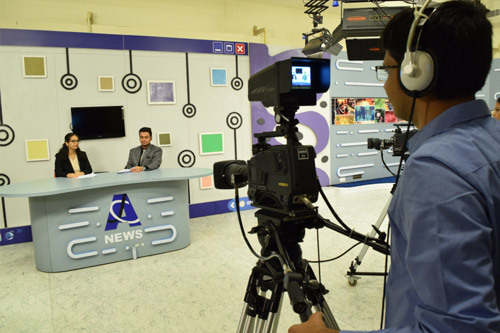 Students in this stream are exposed to emerging trends in the electronic media, to digital convergence, and to different types of satellite telecasting. In addition, they are introduced to techniques of measuring audiences and ratings systems. The other aspects they learn include audio and video streaming; making use of the Internet and digital resources as a tool for research and reporting; understanding the impact of the Internet and the New Media on broadcast journalism; and professional community-building and community-sharing.